Köpenicker Apartment 1 (1rd floor - 5 rooms) - Luxury Apartment, Original Design in Berlin Mitte, 12 people maximum, 152m² living room, kitchen, 4 large bedrooms, 2 full bathrooms, internet, location Berlin-Mitte, Hackescher Markt, Hackescher farms, Alexandeplatz. Description - Sunny and peaceful five-room apartment with a bedroom / living room, 4 bedrooms, large kitchen, 2 full baths on the 1st floor entrance and a beautifully renovated house. 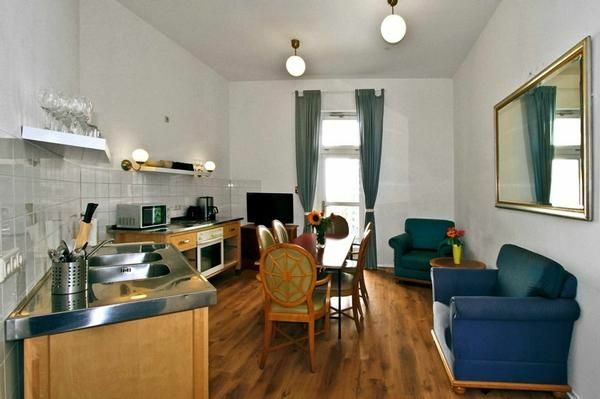 The stylish Köpenicker Apartment 3 in Berlin offers classic elegance in the heart of the district Berlin Mitte. The apartment furnishings are elevated, and include a selection of antiques in glossy walnut and an immaculate facility. There are also subtle elements in the designer decor, which adds a cool Berlin ambience. With the traditional sophistication and a trendy location to enjoy the modern life in Berlin, this apartment offers the best of both worlds in Berlin. This combines the charm of an elegant old building from the turn of the century with the highest standards of comfort and modern technology: High ceilings with old and large chandeliers, high-quality laminated flooring, hand-skirting, combined with beautiful antiques from the early days and the Art Nouveau style with modern classics, design fittings, a for a variety of needs-equipped kitchen, large flat screen TV and other consumer electronics devices on the cutting edge of technology. The large bay windows bring in very much light. All rooms have been in cooperation with the architect, a sought-after specialist in modernization of old buildings, restored with attention to detail in artistically crafted and tastefully decorated. - Cot for children: once per object for rent at a price of 35 EUR (Mandatory). - Parking facilities: per object and day according to consumption (Mandatory). The house is located in the district Berlin Mitte on the Köpenick St. 47A, a dream location in the heart of Berlin-Mitte, with shops, restaurants, trendy bars, clubs Insider, trendy brunch cafes and nightlife in the south of the district. Köpenicker Street is a quiet residential street. In few minutes walking you reach the popular Hackescher Markt, Unter den Linden, Museum Island, Friedrichstrasse and Oranienburgerstrasse with its leisure and shopping opportunities. They live very close to Eastern Railway Station - Ostbahnhof with good connections to the whole of Germany or abroad. Of fancy clothes to go shopping there is the famous avenue of chestnut trees (also popularly nicknamed "Casting Alley") with its many exclusive designer boutiques. The environment is one of the most vibrant nightlife in Berlin and important. A few steps away to the nearest metro Heinrich-Heine-Straße (U8) away. By public transport services take you to some of the main attractions of Berlin such as the TV Tower, the Reichstag, the Brandenburg Gate or favorite place you like Alexanderplatz.